A large amount of prior knowledge on both the part of the educator and the students is required; having some previous experience with this content is helpful in order to teach/facilitate the lesson. This activity could generate more questions than the background info prepares educators for. Not all strategies have sufficient background to promote critical discussion; input from educator in these areas could be valuable. This activity could be used by older students to inform younger students about CO2 emissions and solutions. Students will learn about the impact CO2 emissions have on global climate change. Introduces the concept behind a stabilization triangle (carbon-cutting strategies that can keep the Earth's CO2 emissions trend "flat"). The strategies presented in this activity are i) efficiency and conservation ii) fossil fuel-based strategies iii) nuclear energy and iv) renewable energy and biostorage. 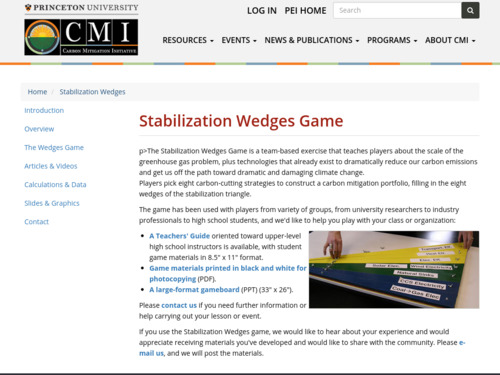 This activity from the Carbon Mitigation Initiative was a joint project between Princeton University, BP, and Ford. Comment from expert scientist: The strengths of this activity are not scientific. It's almost exclusively a policy/technology exercise framed by an initial science lesson. It's good at what it does, but it doesn't teach climate science. Understanding available technological solutions and their potential contributions to addressing emissions challenges is an important part of climate literacy. A good culminating activity for a unit on renewable energy options and climate change. It addresses both the problems and the solutions. Students will develop reasoning and negotiation skills in order to find a solution and defend it to a larger group; there is no "right" answer. This activity is based completely in individual choice and so offers opportunities to a diverse group of learners. Opportunities for adults outside the classroom to become included/engaged with student learning - administrators or community members could judge stabilization triangles. Easy to use, clearly written instructions with all necessary handouts provided.